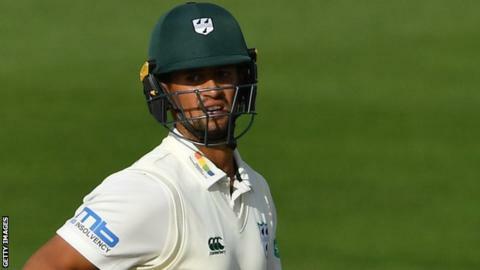 Opener Brett D'Oliveira's 93 anchored Worcestershire's innings on the first day of their County Championship match against Gloucestershire. D'Oliveira, who signed a new deal at New Road on Monday, looked set for a third century of the summer but was out to Tom Smith (3-82) soon after tea. India all-rounder Ravichandran Ashwin batted at six on his debut, making 36. The hosts closed on 338-7, with Ben Cox (56 not out) and Ed Barnard (46) putting on 86 in the final session. All-rounder Barnard, who has also signed a new deal, was run out in the last over of the day by Cameron Bancroft to slightly tarnish a fine day for the Division Two promotion hopefuls. Gloucestershire spinner Smith picked up his three wickets on a used pitch, on his first Championship appearance in two years. "It was a very good day on a tough, slow wicket. We applied ourselves very well as a batting order and it is key that we kick on and push on tomorrow and score big. "Tom Smith span it quite nicely. He varied his pace quite well. It might swing a bit more tomorrow if there is a bit of cloud cover and then hopefully Ashwin will come into the game and we can spin them out. "He showed his class with the bat today. He has scored Test hundreds and anyone who has done that is a very good player." "It is a wicket that has been prepared for Ashwin. It is a used wicket. It's one of those days that you want to contribute as a spinner because you're probably not going to bowl on too many of those in England. "I thought when the T20 finished that was probably the end of my season. But a few people have got injured and given me an opportunity. "We need to wrap it up pretty quickly. It should be easier facing their seam bowlers but obviously Ashwin is going to be out there all day and we are going to have to find a way of combating him."